getfirebug.com has Firebug 1.7a4 (+API doc) with 12 fixed issues. There is also Chromebug 1.7a4 available. All tests pass. Better formatting of stack-frame info in case of exception (issue 1601). Fixed command line API for inspector history (see more). Improved accessibility for the CSS editor (issue 3335). getfirebug.com has Firebug 1.7a3 with 24 fixed issues. Since we have upgraded our build scripts to do more work for us there is also fresh new release of Chromebug 1.7a3 and documentation generated from the source code updated (yes, Chromebug needs more jsdoc compatible comments). Note that you should always use Firebug & Chromebug combo with an exactly matching versions (see more), which is the reason why (from now on) we’ll be releasing both at the same time. getfirebug.com has Chromebug 1.7a1, a release of the debugger we use on Firebug. Firebug 1.7a1 should be installed first. For more information on using Chromebug see the Chromebug User Guide. 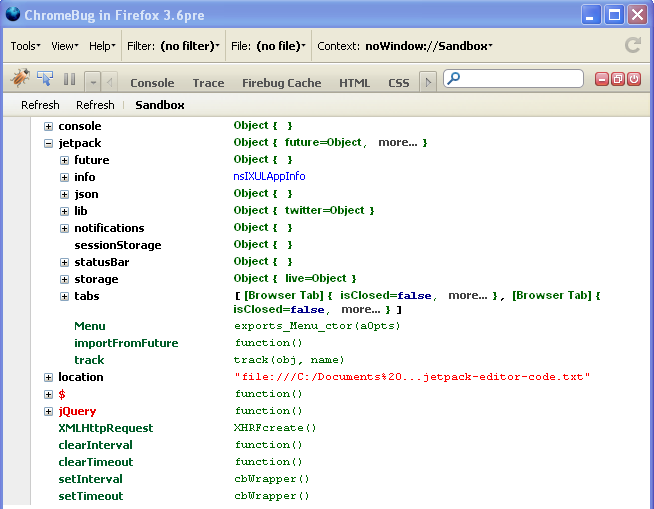 getfirebug.com has Chromebug 1.6a10, the Firefox extension debugger we use for Firebug. When you stop on a breakpoint all nsIDOMWindows have event suppression. Panels, contexts remember their last settings between sessions. Don’t install jetpack prototype or SDK with Chromebug. Please post comments on the newsgroup. getfirebug.com has Chromebug 1.6a7 and Firebug 1.6a7. Yes, I know we just had Firebug 1.6a6. But Chromebug had one problem left to fix: the context did not restore correctly after restarting. After working all afternoon I tracked it down to a line in Firebug. Plus the Firebug command line in 1.6a6 was broken if you used NoScript. What? NoScript and Firebug? Hey it happens. New panel Overlays for window contexts (eg browser.xul). I’ll do a post with screen shots on these soon. getfirebug.com has Chromebug 1.6a5. As usual, this release should be used (only) with a matching Firebug version, 1.6a5. All contexts in the stack are marked as ‘stopped’ when you hit a breakpoint. This means if your stack crosses from say a window to a component, then the debug controls remain available and the stack shows across the top. Like it should ;-). The “all files” menu now syncs to the context’s script file menu to make it a little less confusing. Many smaller bugs as always. Later this evening getfirebug.com will have Chromebug 1.6a4. Attempt to delete Chromebug contexts when windows are destroyed. Seems to be working. avoid the gray blank area at the bottom of Firefox when inspecting. Overall I’m more confident of this version that any in a while. Also available is Firebug 1.6a4. About 10 tests fail, but I don’t know how to fix them. In these cases Firefox generates errors messages without file names, line numbers, or call stacks. I don’t know if we really have test failures or not. getfirebug.com has Chromebug 1.6a3. Please update to Firebug 1.6a3 at the same time. This version add some support for “Sandbox” scopes used by jetpack. Lots of bug fixes so generally it’s starting to work better again. Inspect is working well, but one problem I don’t know how to fix: Firefox 3.6 gets a blank area at the bottom of the page when you inspect. Well, as long you don’t need to debug. Seems like the debug story is writing to Firebug’s Console. Can we have a ‘jetbug’, a Firebug-like experience for jetpack? To start we’d need to understand what is jetpack. In part it is a Firefox extension: we should use Chromebug to investigate. So they put an iframe into the status bar to support HTML! Cool. The console looks like an interface to Firebug. You can see the jetpack object used in the tutorial. Also in the sandbox is some jquery stuff and system functions. Unfortunately there are ten other sandboxes whose role I don’t understand and I can’t find the source shown above. But it’s a start. (Chromebug 1.6a3 will include what I’ve learned so far). Followups on the newsgroup please. getfirebug.com has Chromebug 1.5a4. Chromebug is the Firebug code adapted for XUL applications. It is the debugger that Firebug developers use to develop Firebug. Note: you must install Firebug 1.5 as well as the Chromebug XPI. . If you have looked any previous released version of Chromebug you will see a lot of changes. Some of these are inherited from Firebug. Others are improvements in Chromebug itself. Inspect over Firefox. Probably also works on Thunderbird. Viewing XUL and HTML, CSS styles, Layout and the DOM properties all work well. Error tracking in the Trace panel. File: menu shows all the files Chromebug knows about (well just the JS files now). No support for anonymous XBL nodes because of unimplemented functions. We don’t use Console or Net panel, so we don’t know if the work or not. Tools > Platform shows the components, but it is very slow then crashes Firefox. Some features under Tools have rotted but have not been removed. The source code looks like it was written by someone who did not understand XUL applications and did not have a lot of documentation for some of the APIs. (But its getting a lot better as the causes improve). Finally Gerv helped set up a newsgroup, mozilla.addons.chromebug. I welcome suggestions and comments there. Followups to the newsgroup please. You are currently browsing the archives for the Chromebug category.